The Local Studies Collection of the Blue Mountains City Library (housed in Braemar House) has a wide variety of books relating to all things Blue Mountains, including the literature of Blue Mountains writers. But it also has an extensive pamphlet collection (called the Vertical File), not indexed with the main library holdings , but on a card system within Braemar. A recent acquisition is about to be added to the file titled “Journeys”. The material in this file is fascinating. In the early days of the Colony, after a way across the Mountains had been discovered by the new settlers and Cox’s Road had been built, our intrepid colonials set out to explore for themselves and often to make a new life in Bathurst and beyond. “Journeys” has copies of journals including that of Governor Macquarie kept on his inaugural trip over the Mountains and of Captain Henry Antill, one of the officials who accompanied him. There are also journals and reports of naturalists and scientists, letters and memoirs of an artist, an early photographer and some missionaries. The ladies have their place in the collection too, mostly in the form of letters. Mrs Sophia Stanger was travelling to Bathurst with her husband, Joseph, in search of work. They had five children including an infant, about three months old. * Her letter was addressed to “My Own Beloved Mother”. The indefatigable Mrs Elizabeth Hawkins whose husband was to work in Bathurst, was accompanied by eight children and her mother and she was writing to her sister. Another of the ladies, Louisa Anne Meredith, writer and botanist, was pregnant and going with her husband to visit his sheep property near Bathurst. And there are many more – a real treasure house of reading. Fascinating are some early examples of travel writing published in 1890s journals such as “The Illustrated Sydney News” and “The Town and Country Journal” . They not only promote the scenic beauty spots of the Mountains, but give useful advice for accommodation on your journey. They also provided a vehicle for the advertising of inns, guest houses and boarding schools. Accommodation by this time, of course, was infinitely more comfortable than the sleazy inns available to the early travellers. 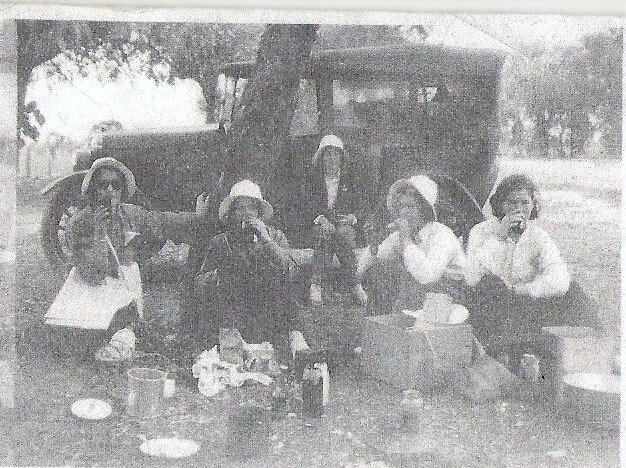 The new addition is a story of more recent origin and concerns five adventurous country girls, Alma and Joyce Eurell, Molly Dunn, Beryl Burns and Daisy Transton, aged from about 21 to 23, who cycled from Leeton, in the Murrumbidgee Irrigation Area, to Sydney in 1935. The previous year they had spent two months planning to cycle to Melbourne for the Centenary Celebrations and remarkably they accomplished this in four days, despite a headwind for part of the way. ﻿﻿Leeton is a pretty town designed by Walter Burley Griffin with a circular design of avenues and streets which were later mostly given the names of trees. It is 585 kms from Sydney and in 1933 had a district population of 7,803 and a town population of 5,351. In 1934/5 the Letona Cannery was the largest industrial undertaking in the Leeton district and the greatest single employer. It became a Fruitgrowers’ Cooperative in 1935. The Cannery building covered 17½ acres which included a building for canning and jam making, refrigeration chambers, a box making section and a storage warehouse for finished products. There was also a plant for can making, a machine shop, steam generating boilers and railway sidings. There were also facilities including dormitories for seasonal workers who were mainly women. 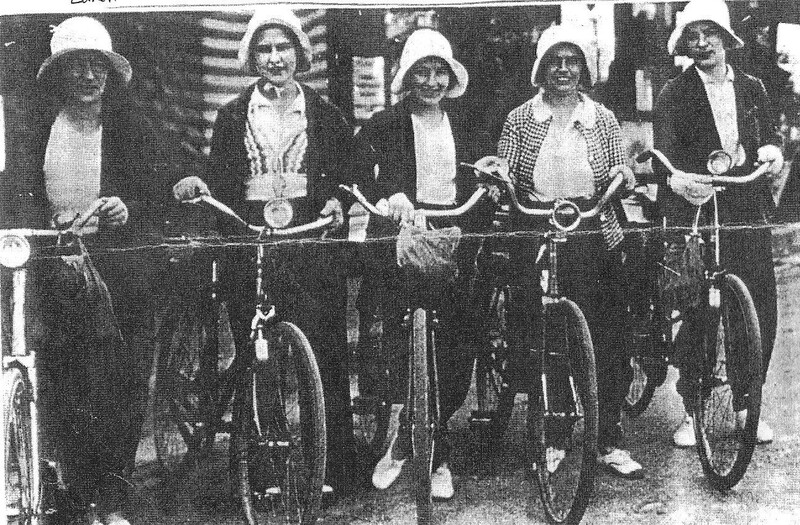 In 1932 over 500 women came for the season. They were employed as piece workers, mainly cutting open and pitting the fruit. Letona canned tomatoes, deciduous fruits, jam and some vegetables such as peas. Our adventurous girls all worked at the Cannery. 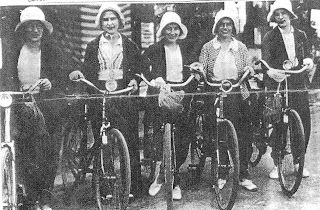 They loved cycling, all had Speedwell bicycles and spent their holidays on these excursions. In 1935 they set out on Tuesday, 17th September. Their departure was not described in the local newspaper, “The Murrumbidgee Irrigator” but in 1934 it was reported that co-workers lined the railway siding to cheer them on the way to Melbourne, and there were also people along the Leeton streets to farewell them. I would think this happened again in 1935. They made good time to Temora, arriving at tea time, despite Daisy feeling unwell all the way. On Wednesday she had completely recovered but they found the next leg, aiming for Cowra, difficult, plagued by bad roads and Mollie’s bicycle suffering five punctures along the way. The last one occurred at night and they were unable to mend it. They did not have a torch and vowed to bring one on their next journey. They walked in darkness for three miles to Koorawatha, ten miles from Cowra. Here they spent the night. The next day they really pushed on over one hill after another, sometimes having to walk and reached Bathurst at midnight. Daisy and Alma went straight to bed, but Mollie, Joyce and Beryl tucked into steak and eggs. The next day they found the Great Western Highway “like a speedway with a billiard-table surface” and were able to spend the night at Lithgow, reaching Katoomba on Saturday at 11.30 a.m. The Katoomba Speedwell Agent, Mr “Bill” Coventry, met them at the office of the “Katoomba Daily” and their photograph was taken. It was said that a Speedwell Agent met them at nearly every town on the route although present day family members believe their trip was not sponsored. We know the five girls had packed their swimming costume and planned to spend a month in Sydney, looking forward to a happy time on the surfing beaches. They told the Katoomba journalists that the roads to Melbourne were better but “the scenery could not be compared with what they had just witnessed”. We have no further information about their journey but we may yet acquire some and it can be easily be added to the Vertical File. *George Mackaness in “Fourteen Journeys Over the Blue Mountains of New South Wales” wrote that Sophia was travelling with triplets. It seems likely that he was misinterpreting something Sophia included in her letter to her mother where she referred to all the advice she received from interested onlookers. Some, she said, “were utterly astonished the young girl should have so many children, and especially three at a birth!” John Low and I feel she was writing humorously to her mother. Sophia, at the time of the journey, would have been 27 years old, she married Joseph in 1836 and they had a baby each year until 1841. The three youngest were very young for such a journey in the winter and would have been very warmly swaddled against the cold making the casual observer believe they were all tiny babies. Good blog. Keep it going. What Would We do Withouth These Words?